Nauplius once more announced the construction of a new tower, the 'Blood Winery', housing tens of thousands of Minmatar slaves, with a singular purpose, to make wine out their blood... His description of how he plans to do this is simply shocking & gruesome, once more rallying capsuleers in a frenzy to take down his newest operation! Having learned from the destruction of his sacrificial Towers & his de-Minmatarization Tower, he fully upgraded its offensive capacities, making it a greater challenge to take out! Despite this challenge, the answer came lightning fast... in less then 24 hours, the Blood Winery was struck by capsuleer forces! 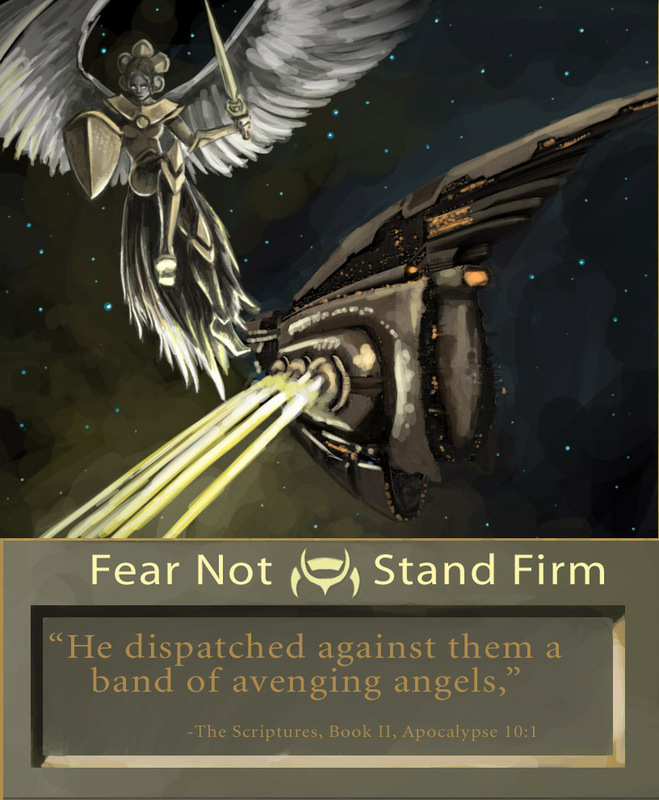 Shortly after Nauplius' announcement, Praetoria Imperials Excubitoris (PIE) command went to work located this latest atrocity to Faith. One of their Initiates, a skilled explorer & scout located this newest Blood Raider tower in no time. Initially the scout was taken by surprise by the heavy armament, but once shifted into a proper covop ship, observations resumed & gave PIE command detailed information about his Tower armament setup! From the get go, it was decided to keep the whole operation under wraps, as to reduce unwanted attention from trigger-happy capsuleers. Once this info was gathered, a joint PIE/PAUX fleet was rallied, along with several supporters joining in the operation. Initially, the assault had to be delayed as the hostile alliance Death by Design was sieging two other towers in the system. Once they left, PIE command authorized the attack, deploying a Revelation alongside the combat fleet, in order to draw the fire from the Tower guns & delivering massive amounts of damage through its siege weaponry. Thanks to the dedication of the fleet, the Revelation was able to siege the Tower undisturbed, disabling it's weaponry in the process. The first attack was a success, delivered fast & hard in joint unison! A day later, the Tower would already go out reinforced mode, allowing its destruction. By this time, the location of the tower was no longer a secret. Situated in the Oyeman system, Devoid region, it was part of the Militia warzone and thereby carried the risk of hostile intervention. Despite the location, several fleets sent course to deliver the final blow to the Blood Winery. On the way, two of these fleets spotted each other, namely PIE/SFRIM & Pyre. As PIE had called on their ally I-RED to assist in the takedown, tensions rose high, due to the history of hostilities between I-RED & Pyre. First to arrive at the Blood Winery was the PIE/SFRIM fleet & the Pyre fleet. as each fleet maneuvered into position to attack the Blood Tower, a lone Pyre pilot went overzealous on the Rules of Engagement & attacked the PIE/SFRIM fleet. This pilot was recalled back into line quickly by Pyre fleet command however, preventing further incidents. Neither fleet was interested in engaging the other over the mishap of a combatpilot. The tense situation was put to the test when the I-RED fleet arrived in system. Having no interest in fighting Pyre, I-RED proceeded with fleet evasion maneuvers, to avoid conflict. As PIE was unable to assist their ally, because lacked the mobility the two caldari fleets had, they focused fire along with the SFRIM forces on the tower. I-REd's fear was grounded, as Pyre was spotted attempting to locate & warp to them. The reason for Pyre's actions is the red standing between I-RED & Pyre, causing them to act on their Rules of Engagement to remove a fleet with hostile standings from the system. As I-RED was unable to assist in the tower takedown due to the relentless Pyre pursuit, they decided to retreat from the system until reinforcements arrive. But before Pyre could make true on their threat, a fourth fleet joined the fray, acting as a pacifying force. This fleet was Ethical Carnage/PIE, who came to support PIE/SFRIM & assist in the destruction of the Blood Winery. With this new force in place, peace returned somewhat, allowing I-RED to return to the system & assist in the tower takedown, under protection of the Amarr fleets. These incidents did cause a major delay in taking down the tower. With Ethical Carnage on the field, peace returned somewhat, allowing all 4 fleets to engage the Blood Winery tower. However, small fire-exchanges did occur at times between Pyre & I-RED. The conflict did not escalate under threat of the Amarr fleets who would not tolerate further major aggression between the two. As the firepower was now mainly focused on the tower, it was destroyed shortly after. But as Amarr forces moved in position to board the Winery Hangar to rescue the slaves, Pyre forces opened fire on the facility, destroying it! Shortly after, both Pyre & I-RED left the field, leaving PIE,SFRIM, Ethical Carnage & supporters deal with the fallout of this tragedy. Under protection of the PIE & Ethical carnage fleet, SFRIM ships proceeded to rescue as many survivors as they could from the wreckage of the facility. Sadly, the delay caused by the conflicts earlier proved to be lethal to the survivors... As capsuleers did their best to evacuate as many survivors as they could, a Death by design fleet arrived on the field. They immediately engaged the Ethical Carnage fleet, resulting in the destruction of several of their ships. While the first attack went flawless, the second attack was a mish-mash of incidents, turning a tense situation volatile. Lucky the various fleet commanders kept their cool, preventing an escalation of conflict. Do note, that in the aftermath, diplomats smoothed out the incident regarding the overzealous Pyre pilot, confirming it was an accident. Pyre also refunded the SFRIM ship that was accidentally engaged, even tho it was Nauplius who destroyed it. Pyre's attack on the hangar was based on their understanding of the situation, believing the only way to get at least some slaves out was by blowing up the hangar, because keeping them locked inside was no option, as Nauplius would use them for just another ritual or horrifying act. The reason Pyre opted for shooting was that they were unaware that PIE was able to board these hangars, due to their collected expertise in previous attacks & boardings of Nauplius' towers. Oyeman Battle Report (check 22 January to see all involved losses) Note that while all offensive & defensive capacities of the tower have been destroyed that day, the first attack on the tower already incapacitated them! Due to this, they were no longer a threat during the second assault. Note, regarding battle-reports of structures attached to a Tower like turrets, hangars and the like. Everyone who engaged the main tower is also listed in the battle-report detailing the destruction of said structures. Those who are listed in it, but have a 0 damage marker did not damage the structure but did take part in the Tower takedown. PIE fleet did the most damage to the facility, as they remained focused on it, while I-RED conducted evasive fleet maneuvers to avoid Pyre engagements until the arrival of Ethical Carnage. From this point onward, all 4 fleets engaged the tower.